In her new book, Back To My Senses, Sharon Watts puts her post-9/11 feelings on paper. An artist by trade, Sharon turned to writing as a way to heal from the trauma of losing her one-time fiancé, a firefighter, who died while saving others in the North Tower. While grieving is a natural emotional reaction to loss and pain, this book reflects Sharon’s personal process. Lisa Dawn Angerame was moved by the truth of her personal experience. While no one can or should grieve alike, this book is a way to find the similarities amongst us rather than the differences, which seems to be the biggest need in this post-9/11 world. 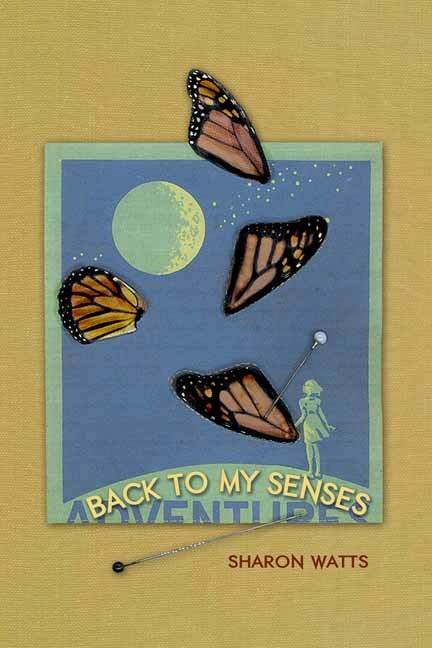 Lisa Dawn Angerame: Sharon, your book is called Back To My Senses but on the cover the word “Adventures” is there underneath, half hidden. Can you explain this? Sharon Watts: The cover is based on assemblage art I made using a cropped 1950s children’s textbook called Adventures in Science and I love it peeking out, because despite everything life throws at you, the spirit of adventure should never be completely buried. LDA: You are an artist and a late-blooming writer. Why did you feel compelled to share your stories? SW: The older I get, the braver I feel. While the actual writing was done only for me, after it sat on the back burner a few years I felt that a quick stir and offering it up was the thing to do. I am somewhat introverted, but wondered if there might be a universal message in here as encouragement to slow down, be still, and pay attention to the little things we learn through reconnecting with our senses. Also, I wanted to write about meditative activities – those that we don’t normally think of as such. LDA: It is interesting that you specifically say you are not a 9/11 widow yet you struggled to deal with the death of someone close to you, Patrick Brown, a firefighter/yogi. Do you think that you were not entitled to grieve as much as someone who was married? SW: We sometimes roll up all manner of previous sorrows, guilt, estrangements, and laments into the grief that comes with the finality of a loved one’s death. We long to make sense, and labels help. Everyone knows what a widow is. At the time of 9/11, I wasn’t completely sure what or who I was. Knowing and feeling something are often truths that want to be reconciled. LDA: Have you reconciled the who and the what? SW: Yes, again, through trusting my inner guide. I kept a journal and collected other people’s stories, which became the book Miss You, Pat. That whole process of acting and creating while grieving gave me an outlet to fully express myself, as well as an overview to how one person’s life and death can cause such a huge ripple effect. It was enlightening and a real heart-opener for me to see how we all can share in the wake of an energy created by love. LDA: I recently heard Dr. Brene Brown, a professor of social work who studies vulnerability, courage, worthiness, and shame, say that she believes we, as a country, are experiencing Post Traumatic Stress Disorder. What you do you think? SW: It’s a term that might be on the tipping point of overuse, partly because PTSD is so authentically prevalent in so many people. I prefer to think of the country as millions of individuals who are subject to endless loops of attention-grabbing and soul-stealing diversions, not to mention so much fear (both legitimate and media-induced), and all the while being literally rewired to absorb all this damaging stimuli. LDA: Do you think we can really get over the loss of someone? SW: No, but we can incorporate it into how we continue to feel and think and live, in a positive way. While I would give anything to reel back the years to September 10, 2001, I know I am a more evolved being today than I was on that day. LDA: Where are you now with all of this? SW: I am in a place where I can actually look back on twelve years and see a trajectory that was very practical as well as spiritual, totally guided by an inner compass. I also, as I approach my sixtieth birthday, am aware of the many things I still want to do, and the fear that still can grip me when I feel untethered. My belief system is undelineated and loosely knit, but it always manages to center me. LDA: How would you sum up what these twelve years have taught you? SW: That time can feel both excruciatingly finite and reassuringly infinite, though usually not simultaneously. This entry was posted on April 15, 2013 by DIRNDL SKIRT in 9/11, Interview and tagged book on healing, firefighter-yogi, Grief Loss and Bereavement, memoir essays, Miss You Pat, Patrick Brown FDNY, post-9/11, Sharon Watts, yoga city NYC.